Note: The text in this shaded box was taken from a different Open Game License product. Nothing in the text should be interpreted as “rules” or “mechanics”. Life is an endless adventure for those who live by their wits. Ever just one step ahead of danger, rogues bank on their cunning, skill, and charm to bend fate to their favor. Never knowing what to expect, they prepare for everything, becoming masters of a wide variety of skills, training themselves to be adept manipulators, agile acrobats, shadowy stalkers, or masters of any of dozens of other professions or talents. Thieves and gamblers, fast talkers and diplomats, bandits and bounty hunters, and explorers and investigators all might be considered rogues, as well as countless other professions that rely upon wits, prowess, or luck. Although many rogues favor cities and the innumerable opportunities of civilization, some embrace lives on the road, journeying far, meeting exotic people, and facing fantastic danger in pursuit of equally fantastic riches. In the end, any who desire to shape their fates and live life on their own terms might come to be called rogues. As a rogue, you have the following class features. At 1st level, choose two of your skill proficiencies, or one of your skill proficiencies and your proficiency with thieves’ tools. Your proficiency bonus is doubled for any ability check you make that uses either of the chosen proficiencies. At 6th level, you can choose two more of your proficiencies (in skills or with thieves’ tools) to gain this benefit. Beginning at 1st level, you know how to strike subtly and exploit a foe’s distraction. Once per turn, you can deal an extra 1d6 damage to one creature you hit with an attack if you have advantage on the attack roll. The attack must use a finesse or a ranged weapon. You don’t need advantage on the attack roll if another enemy of the target is within 5 feet of it, that enemy isn’t incapacitated, and you don’t have disadvantage on the attack roll. During your rogue training you learned thieves’ cant, a secret mix of dialect, jargon, and code that allows you to hide messages in seemingly normal conversation. Only another creature that knows thieves’ cant understands such messages. It takes four times longer to convey such a message than it does to speak the same idea plainly. In addition, you understand a set of secret signs and symbols used to convey short, simple messages, such as whether an area is dangerous or the territory of a thieves’ guild, whether loot is nearby, or whether the people in an area are easy marks or will provide a safe house for thieves on the run. At 3rd level, you choose an archetype that you emulate in the exercise of your rogue abilities. Your archetype choice grants you features at 3rd level and then again at 9th, 13th, and 17th level. 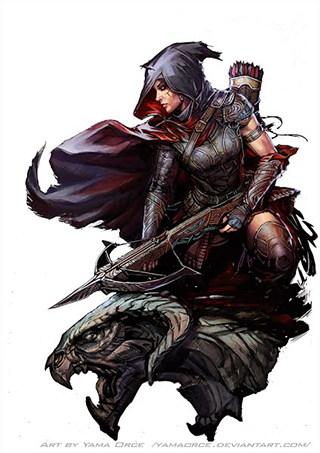 The Thief archetype is the only tradition released by Wizards of the Coast as Open Game Content but there are variants or other archetypes available from other publishers (listed below). When you reach 4th level, and again at 8th, 10th, 12th, 16th, and 19th level, you can increase one ability score of your choice by 2, or you can increase two ability scores of your choice by 1. As normal, you can’t increase an ability score above 20 using this feature. Starting at 5th level, when an attacker that you can see hits you with an attack, you can use your reaction to halve the attack’s damage against you. Beginning at 18th level, you are so evasive that attackers rarely gain the upper hand against you. No attack roll has advantage against you while you aren’t incapacitated. Once you use this feature, you can’t use it again until you finish a short or long rest.